My favourite metaphor for a great project manager is a great cook. Yes, we are taking project management to the kitchen and I will show you why. A great project manager can be seen from a mile away, much like a great cook. Like the aroma seeping out of the kitchen oven, success is evident throughout a project manager’s process and not just from the result. So let’s spice things up! 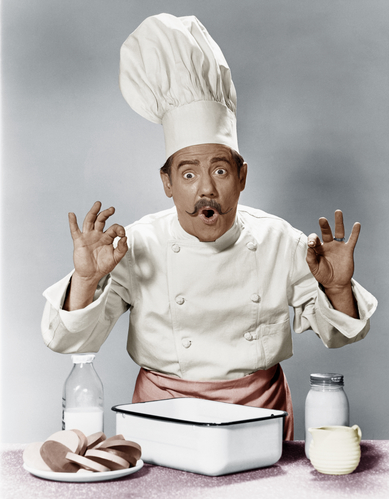 What do successful chefs and successful project managers have in common? They both read the entire recipe before jumping into the task. A successful project requires a manager who knows what he needs to achieve and is familiar with the steps he needs to take to get there. I suppose a project manager could get lucky and “wing” the project without following a step-by-step proven method; however, just like in the kitchen, disaster can strike if a proper plan is not implemented. They both commit to a realistic end result. Have you ever promised a client a lot more than you are able to provide? When a chef sets a menu, he has to consider the price of the ingredients, the time it will take to prepare the food and the people he will be delivering it to. A project manager has to set realistic goals so that his clients do not expect more than they will be receiving. They both follow a method step-by-step. An experienced chef will tell you that the order in which you do things in is essential when preparing dishes; this is because some things take longer than other things to prepare and some ingredients need to prepared as a prerequisite to other dishes. Project management is much the same as some tasks take longer to complete and many tasks need to be done before others. Make sure you are familiar with the method you should be following to complete your project. They both watch the time and don’t waste time. Leave something in the oven for too long and it will burn. If a project manager does not complete a project on time, trust me, things between the project manager and the client will get overheated. Good timing will ensure a satisfied customer. Also, just like a chef is continuously busy (making sure dishes are cleaned, surfaces are wiped, tables are set and vegetables are cut) while waiting for dishes to simmer or roast; a project manager is able to always keep busy while waiting for certain tasks to be completed by either scheduling, preparing paperwork or checking in with teammates. They both pay attention to detail. Most people eat with their eyes before actually consuming the food prepared by the chef. Detail can go a long way in ensuring a happy customer; this is why good chefs pay great attention to ensuring the perfect spice combinations, garnishes and food layout. When a project manager pays attention to small details, such as ensuring all aspects of a project is done properly, paper work is perfect and the final project is flawless, the customer will be satisfied.